Inspired by a real life little girl, Kate + Mim-Mim follows the fantastical adventures of 5-year-old Kate, who, together with her toy rabbit Mim-Mim, travels to the fantasy world of Mimiloo, where Mim-Mim comes alive as a larger-than-life playmate. In each episode, Kate and Mim-Mim and their group of lovable friends discover exciting new places and set off on adventures, all in the hope of solving a puzzling problem Kate has encountered in the real world. In this special Easter event — airing March 18 and 25 at 7 p.m. EST — on Disney Junior, Mim-Mim’s Eggscellent Easter, it’s Easter morning and Kate wakes up super early. She and Mim-Mim twirl away to Mimiloo while they wait to search for chocolate. Upon arrival, however, they discover that Boomer, the youngest of the Mimiloo gang, along with his mini dinosaur buddies, the Tee-Hee Rexes, have already collected all the Easter eggs, leaving none for everyone else! It’s up to Kate, Mim-Mim and the rest of their Mimiloo friends to hop to it and help the Easter Bunny save Easter before the rest of Mimiloo wakes up! Kate + Mim-Mim, now in its second season on Disney Junior, was developed by the husband and wife creative team of Scott and Julie Stewart who based the character of Kate on their real life daughter. 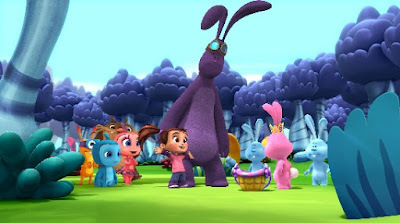 In another added bonus, the real Kate, now 8 years old, voices the character of the Easter Bunny on Mim-Mim’s Eggscellent Easter.